"Our car is not always easy to set up. We have become much better at doing so. 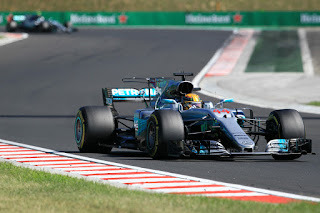 I would like to see Budapest, how the car works with a low speed and high-track-temperatures track. Then, maybe, I will have a more complete picture." It took Mercedes boss Toto Wolff of all people to bring us into line in advance. After Silverstone we thought it simple. Lewis Hamilton had in a single afternoon all but wiped out Sebastian Vettel's long held title lead. 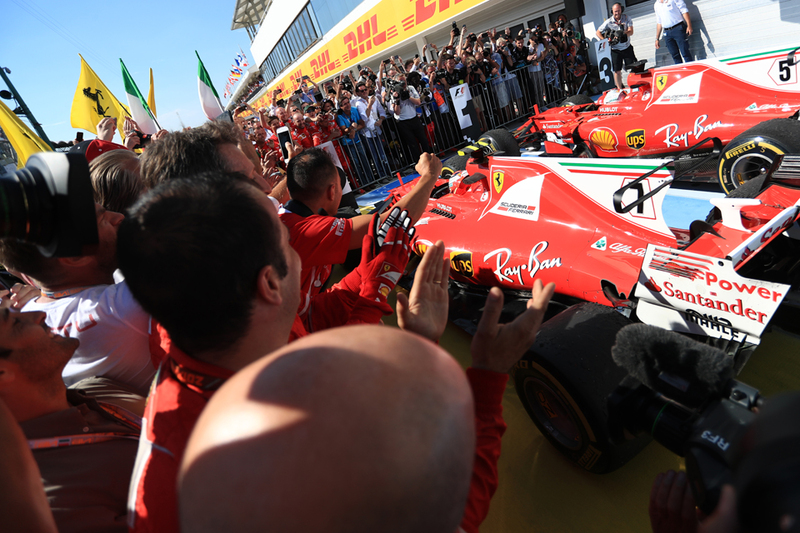 Ferrari hadn't outpaced Merc since Monaco in May. 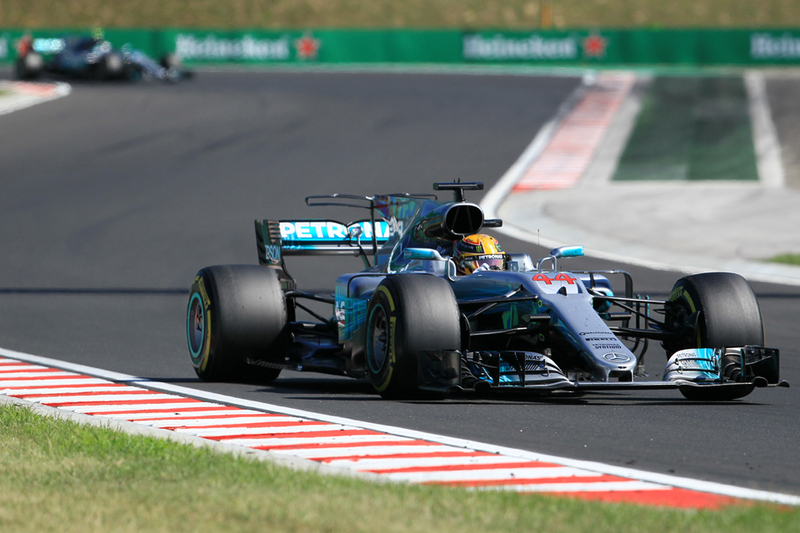 Plus Hungary next up is happy hunting ground for Hamilton. But F1, as well as rarely pure, is never simple. Wolff's words were prophetic. And the mentioned previous circuit where Ferrari was on top - Monaco - also was instructive, as Hungary's sinewy track is long since known as Monaco without the houses. The short wheel base Italian car is suitably nimble, and where high downforce settings are required Ferrari produces more downforce than anyone. Just as in Monaco it was quickest from an early stage. Just as in Monaco it got a one-two finish with Seb ahead. Just as in Monaco there were however adventures in getting there. The other Ferrari of Kimi Raikkonen might have got pole but made errors. Then come the race while Seb built a three second cushion early it then looked like his day would unravel. He reported the worsening of a steering problem. It meant not only staying off the kerbs but being unclear how much steering input would be required particularly on left-handers. Kimi closed in. And the Merc pair closed in on Kimi. Conundrum. But Ferrari solved it in classic Hungaroring style. It battened down the hatches. Overtaking in the modern F1 car ain't easy. Overtaking at the Hungaroring especially ain't easy. Add in that Kimi - championship and perhaps his own retention for 2018 in mind - was providing a rear gunner role as well as that strategy variation in this one-stop race was minimal. We had a holding pattern. There was tension as the top four ran in close company for an extended period. But given everything the tension was illusory. They finished in the same order. "Yeah, the other guy has to do quite a big mistake or have some issue," noted Kimi on the prospect of passing. "It’s a shame, we had good pace in the end today but with the starting position we couldn't finish any better," added Valtteri Bottas in a similar vein. Such thoughts weren't so front of mind to the winner though. "It was a really difficult race," said a relieved Seb on the podium. "I don't know why the steering started to go sideways and it seemed to get worse. Then I stayed off the kerbs, tried to save the car. It wasn't easy. "I didn't do a favour to Kimi who obviously could go faster. I didn't have the pace. But then towards the end it did come back a bit. But yeah, I really had to stay focused the whole race." Bottas was the lead Merc, in large part due to starting a place ahead (natch) in third to Lewis's fourth - aided by the latter not maxing his quali efforts. Lewis looked quicker in the race though and - albeit not helped by his ship-to-shore radio going down for a time - was via a team instruction allowed past by Bottas at two-thirds' distance to attack Kimi, and indeed dipped immediately a second under the lap times Bottas had been doing. But he hit the wall described. 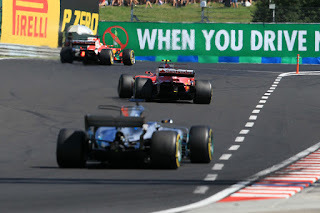 Kimi also was expert in defence - of his place and of his hobbled team mate. Lewis - as dutiful as Kimi - at the last allowed Bottas to re-pass as agreed for third. As if to underline that F1 observers will always bore holes whatever you do a few quickly questioned Lewis's decision and speculated what if he loses the title by those ceded three points or fewer. But there would have been negative consequences the other way too - that a (potentially) demotivated Bottas might not take as many points off Vettel here on in. As well as likely would not be as minded to aid Lewis's own quest. Plus, from Merc's point of view, it's easy to forget Bottas is in the title fight too. "I don't know whether it will come back to bite me in the backside," said Lewis later. "I said at the beginning of the year I want to win it the right way and it was the right way to do things." If Ferrari and Mercedes demonstrated their own variations of team harmony there was little of it elsewhere. 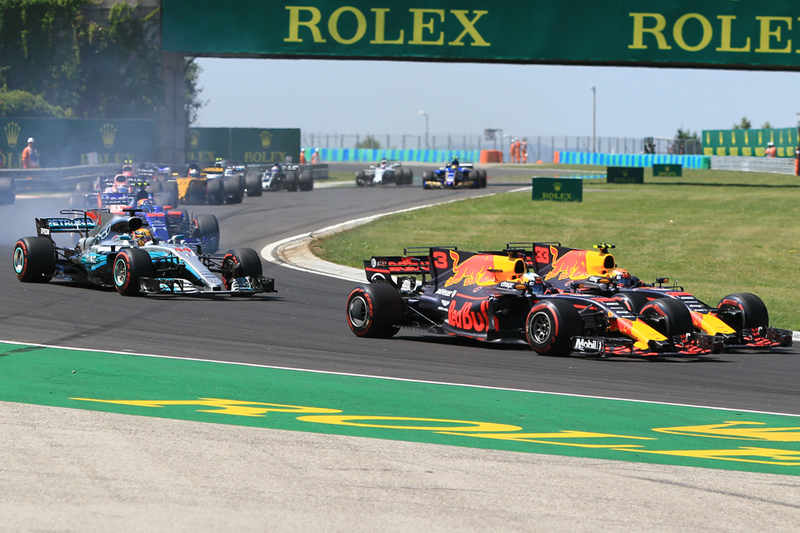 Red Bull in Hungary had for a time its most encouraging weekend in a long while, looking often the quickest car out there with an effective B-spec machine debuted at a track that suits its car perhaps to a greater extent than it does even the Ferrari. It couldn't crank its engines up for qualifying so locked out the third row only, but hopes sprung eternal for the race. 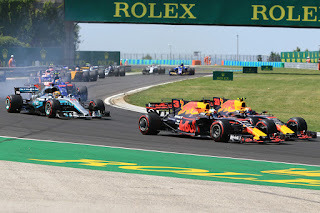 Well they did for two corners, as at that point Max Verstappen - who'd been shuffled out wide at turn one by Bottas - sought it seemed to make the loss back pronto yet braked too late and got into the side of his team mate Daniel Ricciardo. This put Ricciardo out with a holed radiator and puncture (he was atypically irate) and Max got a 10 second penalty. That Max finished nevertheless on the Mercs' tail in fifth showed the potential scuppered. The Force Indias got together too at the start; banging wheels at turn one. Sergio Perez said it was one of those things; Esteban Ocon was less charitable. The Frenchman carried floor damage from then on too (Checo had front wing damage albeit less critical). The Silverstone squad nevertheless got its standard double points finish, this time for eighth and ninth. Fernando Alonso showed his sorcery by being best of the rest at a track that least shows up his Honda's shortcoming. He got the better of Carlos Sainz after a fierce scrap then hustled it home, even setting fastest lap on the final tour. Sainz was next in. The other McLaren in Stoffel Vandoorne's hands took the final point - his first in F1. For Ferrari meanwhile amid the triumph there remain things to ponder. Not least that of the nine remaining rounds perhaps only Singapore is of the sort which we're now clear that it'll dominate on. Spa, next up after the summer break, the team has admitted will be a struggle. 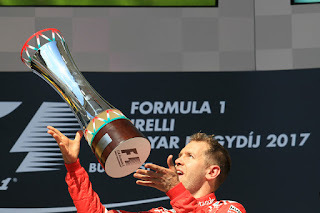 It seems an odd thing to say of the long-time leader, now with a 14 point lead for Seb, but if Ferrari hadn't won in Hungary we likely could have started to feel confident in predicting a drivers' title to one in silver. Ferrari had to deliver in this one. And it did. Ferrari has a lot of work to do now after too many DNF and has to improve reliablity concerns as well.